The Metabolizer application enumerates the metabolites of the given substrates, and predicts their most likely major metabolites. The knowledge base for the enumeration and prediction is provided by biotransformation libraries. A human phase I xenobiotic biotransformation library is built-in the application, but you can load your own library as well. This document describes how to use the graphical user interface. Select the File/New... menu item or click on the New... tool button to open MarvinSketch structure editor. You can load your substrate file, draw a molecule, or paste one into MarvinSketch. When you press the Accept button of the dialog, the substrate is placed on the Tree page as the root of the metabolic tree. Set the Generation Limit, select a compound, and start the enumeration by clicking on the Calculation/Calculate Exhaustive menu item or its tool button to start an automatic enumeration. The process can be stopped by pressing the Stop tool button . Since this mode exhaustively produces all metabolites and their metabolites, combinatorial explosion may be a risk in case of a high generation limit. The Calculation/Calculate action helps to decrease this risk by enumerating the major routes only. Both automatic enumeration methods can provide the same set of the most likely metabolites, the latter is just quicker. It is possible to drive metabolite enumeration manually by opening the metabolites of a compound by clicking on the plus sign before its image. The plus sign opens the corresponding branch of the metabolic tree displaying the underlying metabolites. 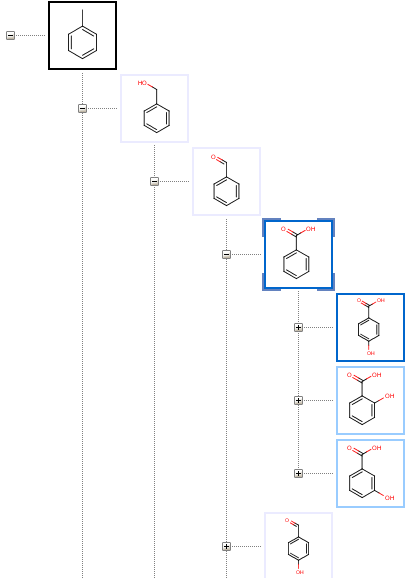 If the metabolites are not available yet, enumeration populates the tree with the direct metabolites of the actual compound. 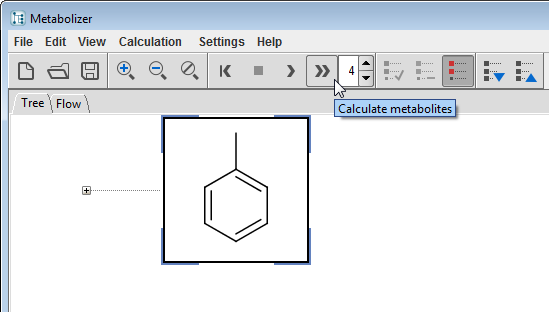 Existing metabolites are not re-enumerated by collapsing/expanding the nodes of the metabolic tree, but if you would like to do that, you can reset the calculations from the Calculation/Reset Metabolism menu or the corresponding tool button . Though, Metabolizer is shipped with a buit-in biotransformation library by default, it is possible to load your own custom library even for predicting the metabolites of other species (i.e. bacterial, plant, mammal, rat). 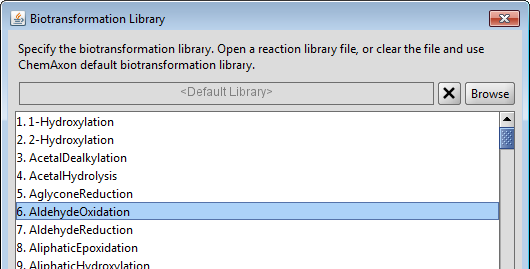 The Library Options dialog can be reached from the Settings menu. ChemAxon's reaction editor can be used to modify an existing biotransformation library or to create a new one. It allows to examine the schemes of the generic biotransformations, reactivity and selectivity rules, literature references and examples. See the Reactor documentation for more details. The Rank property is special for Metabolizer, it is a required value for major metabolite prediction. In general, the higher rank means faster reaction, but the final results are influenced by other factors as well. The Tree page displays metabolites as nodes of a tree having the substrate in its root on the top, and child metabolites sorted by their predicted formation rates. The Flow page shows metabolites sorted by their estimated global accumulation values, so the most likely metabolites are on the top of the list. Automatic enumeration can be performed on both pages, but the manual operation is possible in the Tree view only. The metabolic formation route from the substrate to the selected metabolite is displayed at the bottom of both pages. A limit is always set for the number of generations produced to avoid infinite execution of automatic enumeration. The optimal value depends on the substrate and the goals of the experiment, but setting this limit to 4-6 generations is the most common. It is possible to specify a calculated expression to avoid the further metabolism of specific metabolites. Such conditions may limit the size or some calculable physical properties of the molecule. The Termination Condition can be specified in ChemAxon's Chemical Terms language which provides hundreds of chemical calculations. The Termination Condition dialog is available from the Settings menu. The Exclude Condition is a similar calculable expression to the Termination condition. It can serve as a black list to avoid unwanted metabolites in the output, such as small common fragments that are out of interest. The Exclude Condition dialog is available from the Settings menu. You can modify the default likelihood ranges in the Settings menu. 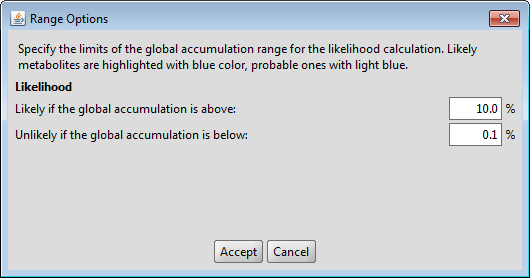 Metabolites with high global accumulation values are considered likely and highlighted with blue color. The initial molecule subject to metabolic reactions. A product of the metabolic reaction. It can be subject to further metabolic transformations. The computational process of creating metabolites from the substrate. Metabolites produced from a substrate by the same number of biotransformations. 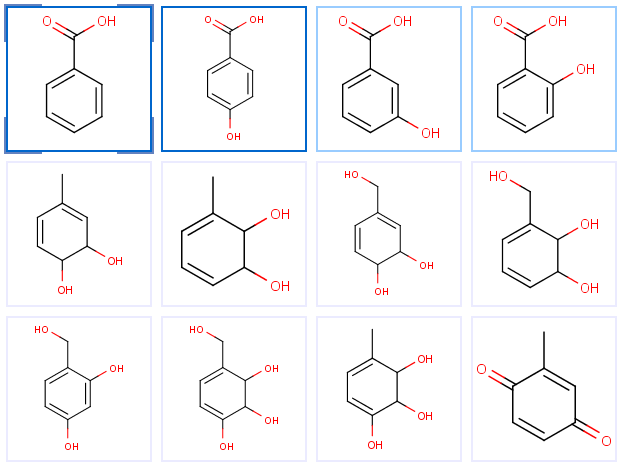 A set of generic reactions defining the transformations for the enumeration of metabolites. Priority of a generic biotransformation (positive integer or zero). The relative amount of the original substrate transformed to a given metabolite. An indicator of major metabolites calculated from production and the rates of formation and consumption reactions of a metabolites. Major metabolites accumulate faster than minor ones.